Grace doesn't have a whole lot to say yet. Joe and I are both pretty quiet, so maybe that has something to do with it. She's recently become a lot more vocal (she loves to "sing"), but not too many real words yet. Seeing her grow over the past two years (almost), I've realized that Grace is a bit of a perfectionist. She doesn't just try something and do it part way. She watches and analyzes something until she KNOWS she can do it without failing. She was like that with walking. She didn't start off with a step or two here and there. Her first attempt at walking was something like 16 steps at 11 months old. She didn't walk again until the day before her first birthday and hasn't stopped since! If she handles talking the same way as she did walking, she'll be hitting me with a full sentence one of these days! Really, though, she has said a few words. Daddy. Remmy. Pretty. Ready. Cookie. It's a toss up between Daddy and Remmy as to which was her official first word, but if you notice "mommy" is not on the list! 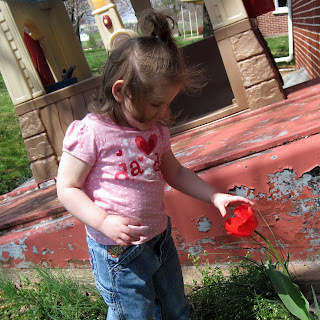 I was shocked a couple of weeks ago when I took Grace out in the yard on a beautiful sunny day. A couple of tulips had bloomed and she spotted them right away! She was so excited and yelled: "Flower!" and took off across the yard. I was telling her "no, no!" and "be nice" not wanting her to tear it out of the ground! I'm not sure if she was even paying attention to me or not, but she bent over and sniffed the tulip! I was really stunned, since we haven't been around any flowers since last summer and I wouldn't think she would remember to sniff the flowers from that far back. Also, I love the fact that *Flower* is included in the list of her first words, since I worked in the floral industry for over 15 years! 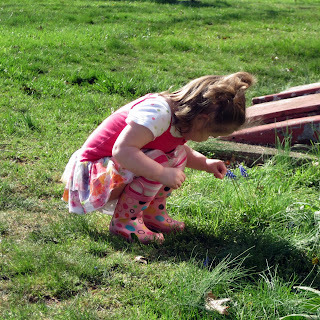 She likes the grape hyacinths, too! She picks off each little flower and hands them to me! Great post, beautiful little girl! That is a lovely little girl to adore. What a sweet post, she is adorable, and it looks like she has an appreciation for nature already.